It's pretty obvious that most mainstream fashion has a plus-size problem. This is perhaps epitomized by fact that the "fatkini" sold out instantly — when the needs of plus-sized women are considered by designers (which occurs fare more rarely than it should), the clothing in question is often woefully understocked — or it's ill-fitting. Cornell apparel design sophomores Brandon Wen and Laura Zwanziger attempted to remedy this problem by designing their own plus-size line and realized something interesting in the process: although it's difficult enough to find full-figured mannequins to design clothing on, it's nearly impossible to find realistic full-figured mannequins. So few clothes are made exclusively for larger women that there’s a scarcity of full-figured mannequins available, and the few that exist resemble crudely scaled-up versions of thinner women of Barbie-like proportions. This is why, as Zwanzinger notes, “A lot of the clothes [for plus-size women] are really just sized up from smaller proportions, which fit really strangely." Not wanting to contribute to the problem, the duo teamed up with department professor Susan Ashdownin order to analyze thousands of 3-D body scans of women and create a prototype of a "pear-shaped, size 24" dress form. “Instead of just scaling up something designed for a different-sized woman, or even thinking about clothing as something to disguise a body or make a body look different than it is, the students sought to celebrate shape as it really is,” says Ashdown. 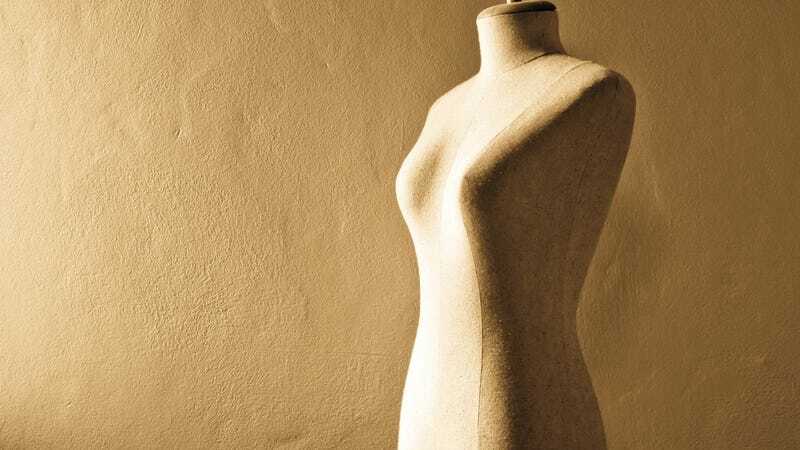 Using a dress form that actually looks like a real woman should seem like an obvious idea; the fact that it's innovative to design clothing on a mannequin that reflects reality is more than a little troubling. The attitude that the plus-sized body must be treated as some sort of variant of the glorified "thin body" serves to normalize an unachievable standard of beauty. The belief that larger bodies must be disguised because they're somehow shameful is unhelpful, punitive, and regressive. It's this kind of tacit approval of fat-phobia that's responsible for our culture of rampant body shaming. Another important thing to note: the spending power of the plus-sized market is formidable. According to Zwanzinger, plus-size women hold 28 percent of purchasing power for apparel and accessories, but their spending only accounts for 17 percent of purchases. To revisit the "fatkini" fiasco, it's clear that there's a huge demand for attire that flatters (and doesn't merely seek to hide!) full figures. Thus, if the desire to not be a hoard of uninformed, ignorant asshats will not move the mainstream fashion industry, maybe the dulcet reasoning of capitalism will. As Zwanzinger so eloquently puts it: “Issues of health aside, we’re all different body shapes and body proportions. Each person deserves to have clothing designed for them as they are, not as they relate to some abstract industry shape.” Amen to that.